Winter has settled in. We have had snow on the ground for a while now. For the first time in many years our end of Skaha Lake has frozen over and the kids are delighted to have cleared the ice and created their own rink. 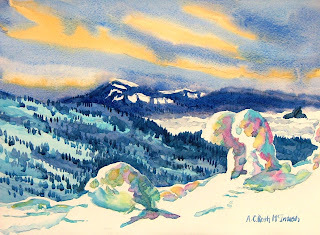 While I have painted several acrylics this winter I did finish this watercolour of late afternoon light on the back of Apex Proper--our local ski hill. Thought you might enjoy visiting websites of some of my favorite inspiring painters. I just returned from an exciting workshop learning to paint acrylics with Brian Simons. Check his work out at http://briansimons.com/. Mr. Westernman is an amazing watercolourist. You'll love his bright and wild paintings. I have a very inspiring book filled with his painting images and tips. You can see his work at http://www.arnewesterman.com/. Toronto artist David McEown is brilliant. He's out there painting in all sorts of weather-- at the north pole and the south pole. I have been enjoying images of his work posted on the internet for several years. Any BC artists wanting to learn from him should attend the workshop they'll be holding next March at Arbutus Ridge. 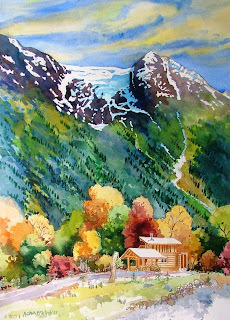 Check out his wonderful paintings and learn about his exciting trips painting at the north pole at http://www.artistjourneys.com/painting.html. Betty Carr's wonderful light filled images can be seen on the web at http://www.bettycarrfineart.com/257/lp_1801/skin_/fs_/lg_en/pg_artist-artwork.html. I have always been inspired by the brilliant light in the watercolors and oil paintings of John Singer Sargent--truly a master painter. You can see his images and learn about his life at this website-- http://www.jssgallery.org/Major_Paintings/Major.htm . Mr. Lowrey's work is delightful. He captures light in watercolour beautifully. I wish he was closer as I'd love to attend one of his workshops. http://www.lowrey.co.uk/. Mr. Ng's work is fantastic. Check it out at http://www.ngwoonlam.com/home.htm . More great work here too-- http://www.ongkimseng.com/works/works.htm . Mr. Lynch has always been one of my favorite painters and I was lucky enough to attend a workshop by him in Kelowna many many years ago. http://www.tomlynch.com/paintings_paper.cfm . Hi and Welcome to my Making Art Around the World Blog! I am an artists living in south western Canada. I love travel and paint around the world where ever I go!! I am also trying to create a network of artists that can connect and inspire themselves and the general community around us!! In this blog you will hear about my latests trips and see what I have been making or on some days we may look back on a previous journey. Maybe you'll visit my studio in Penticton. You will also travel with me to my artists' retreat in northern British Columbia a minute from Alaska in a small town called Stewart. Perhaps other artists will join with me as we work to create a network of artists and studios around the world! !